Amid Hollywood's most glamorous yearly event, it's pretty crazy that overflowing toilets almost put a serious damper on the evening. At the very least, they did succeed in making the evening damper. According to the New York Post and the Los Angeles Times, just under an hour before the big show on Sunday was scheduled to begin, a water pipe in the Dolby Theatre exploded, forcing six custodians to scramble to mop up the mess from an overflowing second floor women's bathroom. The Times explains that the custodians were decked out in black pants and suit jackets and used a pair of home-sized wet vacuums and what witnesses described as a "machine the size of a lawn mower" to undo the water damage in time for the show. This caused some additional confusion - The Times explains that workers who were in charge of locking a stage door nearby where the Oscar statures were to be stored were temporarily preoccupied cleaning up the flood. 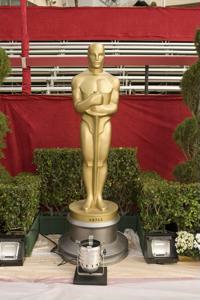 Luckily, no sources we could find say anything about Oscar statues being stolen. Apparently, the flooded bathroom prevented awards-show attendees from buying drinks at the second-floor bar. Luckily, the spill was cleaned up by the time the curtains were set to open. While it seems to have been a fairly easily-resolved plumbing malfunction, that didn't keep the entertainment media for doing some digging into what TMZ calls "The Great Toilet Disaster" of the 2013 Oscars. The website implies that the burst pipe was due to a clogged toilet, however only uses an unnamed source to support this information. Another source who spoke to the Daily Mail said the clogging was due to one toilet being repeatedly flushed. Grant Heslov - producer of the best picture winner "Argo" - told the news provider that he had to hold off relieving himself at one point due to the bathroom being closed off. PopStopTV.com pointed out that, considering that the Oscars is a three-hour long ceremony, anyone with an urgent need to use the toilet was probably wise to do so before taking their seat in the theater. It just goes to emphasize the importance of making sure your plumbing and toilet are working properly. While an average homeowner's dinner party or other gatherings may not have the cultural significance of the Oscars, it could still be embarrassing if a toilet malfunctions or overflows while guests are present.